Out of all my rail adventures in the USA, Mexico, Guatemala, Austria, and Germany, it's very hard for me to decide which was the best. Certainly the largest number of incredible things have happened to me in the magical country of Guatemala. But, judging by any standard a person could think of, my visit to East Germany's famous Harzer Schmalspurbahnen will always have to be considered absolutely first rate. It is, of course, impossible to choose a favorite from the friends I have made among the steam locomotive workers in these countries. 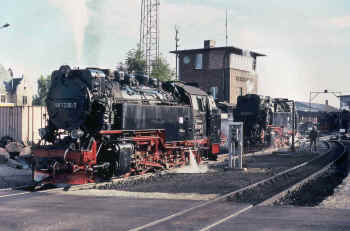 The day begins early in Wernigerode, Germany as six meter gauge 2-10-2 tank engines and two "Malletlok" 0-4-4-0 tanks are prepared for a day of hauling passengers on the Harzer Schmalspurbahnen. All photos by Sammy King. 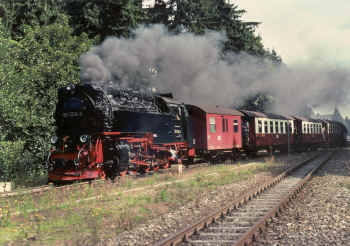 The Harzer Schmalspurbahnen is the largest tourist railroad in Germany, and is powered mostly by steam engines. In mileage and available steam locomotives and rolling stock, it is roughly equivalent to both of Colorado's famous narrow gauge tourist railroads combined. It far surpasses them in frequency of service, and carries approximately a million passengers every year. 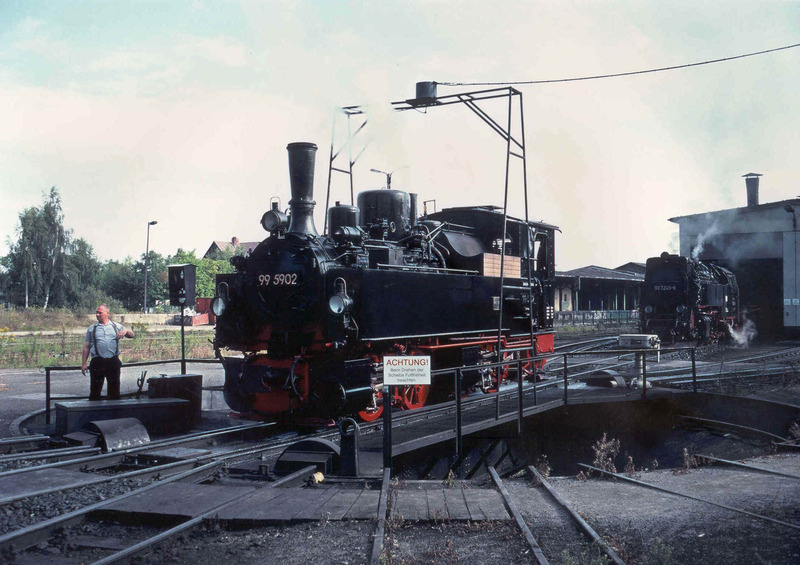 It was the largest of a number of smaller narrow gauge railroads that were maintained as "technological monuments" by the East German Communist government, and is the only one of meter gauge. 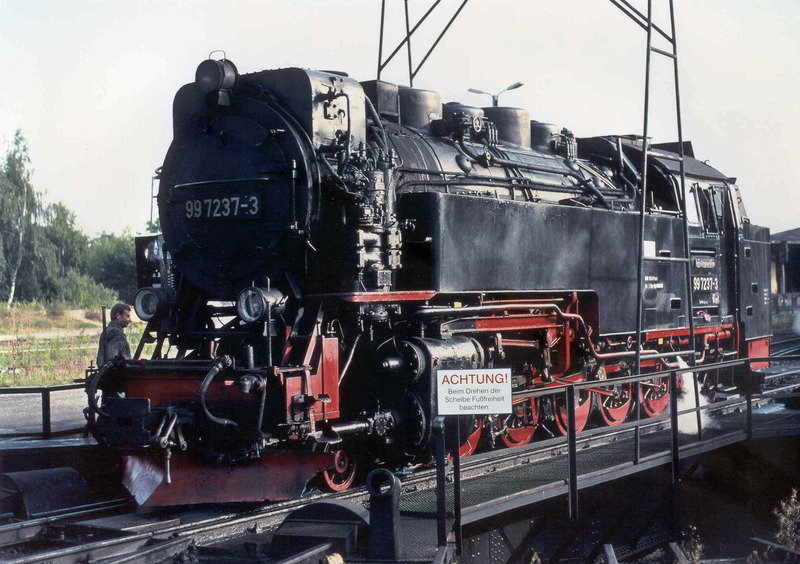 This group of preserved railroads continues wonderfully the atmosphere and traditions of the old Deutsche Reichsbahn with it's highly disciplined and professional operations. 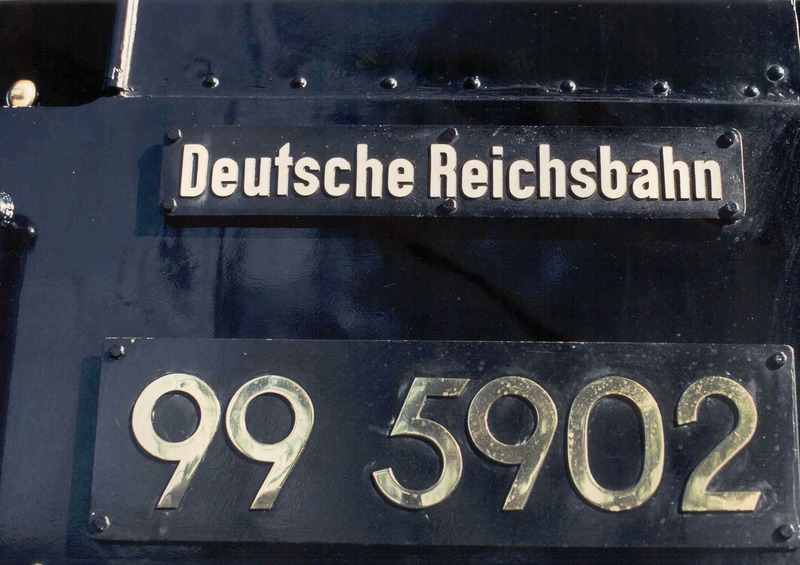 The Deutsche Reichsbahn was one sharp outfit. Things have changed very little since the days of the East German State Railways, or Deutsche Reichsbahn. Of all the places covered in my articles, only the HSB can still be visited running a big steam operation in all it's glory --- the others are mostly memories now. It seems as though everywhere I went on the European rail system, I somehow gravitated toward the same section of any given train where the employees sat while deadheading. The last leg of my trip on the Deutsche Bahn from Salzburg, Hildesheim to Wernigerode, was no exception. Sitting near me in the otherwise empty rear section of the modern, two car, double ended, articulated train set were two off-duty Deutsche Bahn workers, a lady train guard, and a civil engineer, also going to Wernigerode. As part of their jobs, many DB employees learn basic English, and as their life passion, many of them are dedicated train freaks. In most towns of any size we passed were small railroad heritage exhibits, usually at least a nice size steam engine and some period cars, and sometimes also the old depot, signal box, or roundhouse buildings. Several of these displays featured fireless type steam engines, some of which must surely still be working in eastern Europe. The train yards currently in use are mostly reminiscent of World War II development, a period of greatness for railroad workers in every country involved by the war efforts. Sure enough, it wasn't long before the gentleman sitting near me noticed that my eyes followed the alignment of every switch, and the indication of every signal, and that we were both staring out the same windows at the same times. He explained to me in English that we had now crossed over into the East, and that as we left electrified territory behind us, we were riding on the rails of the Deutsche Reichsbahn. Seventeen identical examples of this husky, modern design do most of the work on the HSB. Drivers are one meter in diameter, about 40 inches. 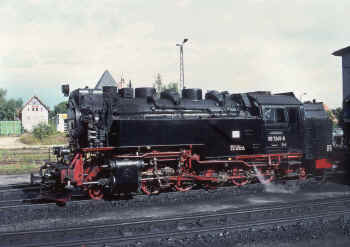 Modern 2-10-2 tank engines were used by the East German State Railways for 750mm, 1 meter, and standard gauges, built in small, medium, and large versions correspondingly. Many of all three sizes are still working today. It was not surprising to him that I should be going to Wernigerode, and he pointed out the meter gauge tracks behind the shop complex at Westerntor, two km from our station stop. As we both detrained, he told me that the town is one way, but I should walk a different path with him down the station platform, and over next to the roundhouse. It was already too dark for handheld pictures, but I was transfixed with joy when I looked over the low chain link fence and beheld the contents of the roundhouse ready tracks. There were six 2-10-2T locomotives parked outside, every one obviously put away hot and prepared for use the next morning. But what was even better than that was the two 0-4-4-0T Malletloks also obviously awaiting another call very shortly. Even in my adventure in Mexico City back in 1966, I don't think that I encountered eight steam engines all hot in one place at one time. We smiled, and my friend asked me if I was going to take any pictures. I replied that I was going to save my film till the sun came out, and that if it didn't come out in the next two days, I would make an all nighter of it with tripod and flash gun before my departure. It bears mentioning that growing up I was always led to believe that the regions behind the Iron Curtain were nothing but salt mines and prison camps, totally devoid of culture and beauty. Thus I was surprised to find that was nothing close to the truth, and that this Harz mountain region where underground factories had produced flying bombs during World War II, was also a very clean, tidy, and architecturally rich one. It is also the land of Guttenberg, von Goethe, Bach, Biber, Strauss, Schumann, and Mendelsohn. My hotel, while expensive, was very luxurious and situated directly across from the famed Rathhaus, or city center building. All I can say is that everything appeared fantastic to one such as myself who knew only North and Central America. Quite a bit of Germany and Austria really does look like The Sound of Music, and the parts which don't, resemble old war movies. I didn't make it up to the castle above town during my two day stay, but it has to be well worth seeing. 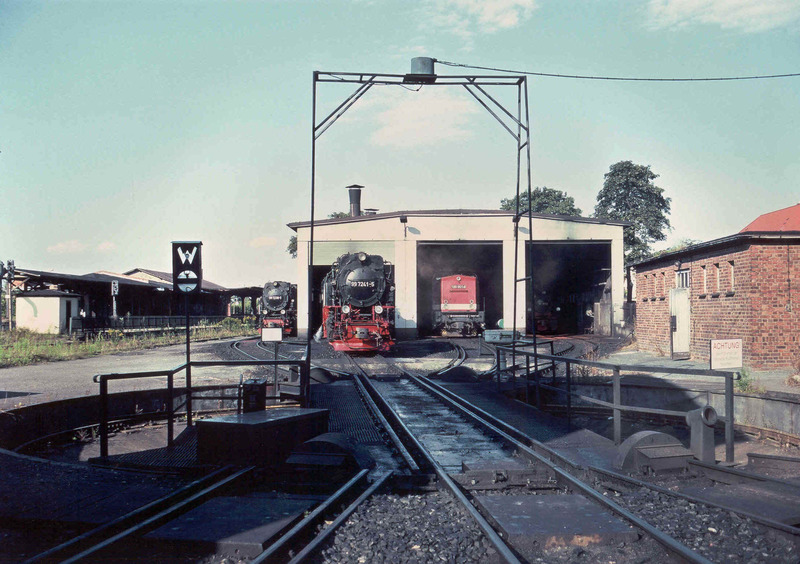 While many contemporary steam workings are located in relatively underdeveloped, impoverished, harsh locations, the HSB is quite the opposite. The next morning, I was at a table in the restaurant well before they opened. The help saw my camera gear and that Hell bent look on my face. They decided not to mess with me, so I was served the same coffee they were drinking, and gobbled food off the buffet platters as they were being brought out and set up. When they opened the till at exactly one minute after 6am, I settled up and dragged myself down to the yards. My feet were not much more than French fried blisters and bloody sores after a month in Europe with no car and new shoes. The second Malletlok is set over one track for coal, while the last of the standard class engines waits her turn. It's not polite to just walk into a restricted area such as the roundhouse and start nosing around, so I tried all the depot doors first. I got inside, but they weren't dealing with the public yet. I excused myself, and tried the first trainman I saw wearing a traditional DR Prussian style leather cap, crossing the platform on his way to report. I had learned very little German, but he saw the cameras and the dictionary and got my drift somehow. Then he pointed out a small bench in a perfect location next to the turntable pit and a narrow path through the fence, and asked if that was OK. I thanked him and went over there, took a seat, and got ready for the morning rush. I had the whole place all to myself. The sun came out, the clouds burned off, and the hostlers started servicing and steaming up the eight locomotives I had seen the night before. Then, one by one, they all went to the depot or coach yard, and left town with their trains promptly thereafter. Although the HSB hauls some freight, the atmosphere is that of a steam powered commuter railroad. It was very lucky for me that my visit was during a holiday week, and that every railroad I visited in East Germany was as busy as they could possibly be. The spot was perfect, and I was able to open up my camera bag and switch lenses around on my vintage Pentaxes, taking full advantage of a steady parade of 2-10-2T "Neubauloks". These are the ultimate modern narrow gauge steam power, and make the Colorado engines look scrawny by comparison (you notice I didn't say that about our very beautiful GUATEMALAN steam locomotives). 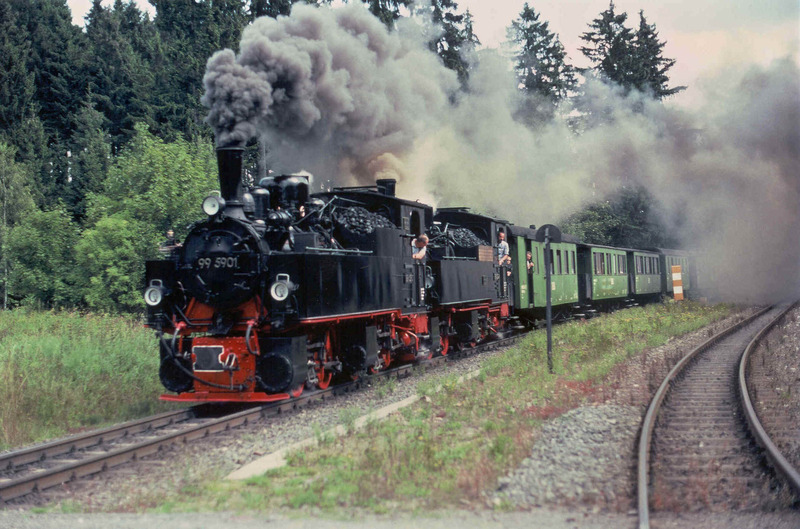 The Reichsbahn Malletloks were smaller, older, and more artistic looking, and seeing two of them working at the same time was pretty unbelievable. 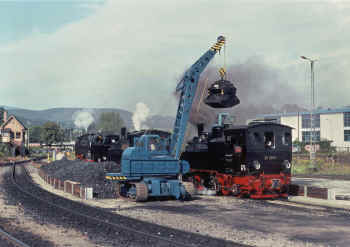 Compressed air powers the crane used for coaling HSB power. A recent entry in a very upscale magazine said that the HSB is converting to electric railcars, and that steam is doing a lot less these days --- DON'T YOU BELIEVE IT. However, they are absolutely right in urging interested parties to visit at the earliest opportunity. After the roundhouse emptied out, I decided to try and get out on the line and set up for some pictures of the two Malletloks, the last engines prepared that day. I bought a ticket to Drei Annen Hohne, the junction point for the frequent trains on the Brocken Mountain branch, then I caught the next train leaving Wernigerode. Drei Annen Hohne is a water stop and meeting point for all trains, and has a nice big station building with gift shop and plenty of food and drink available on the platform. There are three passing tracks here and a train order operator. 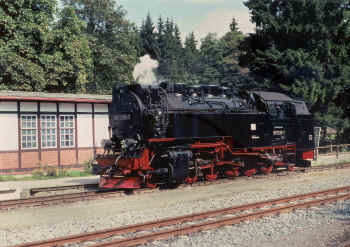 Signals are controlled from a dispatching office in Wernigerode, and all movements in the station are made under signal indication. There is always something going on here, with trains constantly meeting, stopping, taking water, engines running around their cars, etc. I just found a shady spot to sit near a good sunny spot for pictures and got comfortable. I didn't have long to wait before I heard two little peanut whistles. 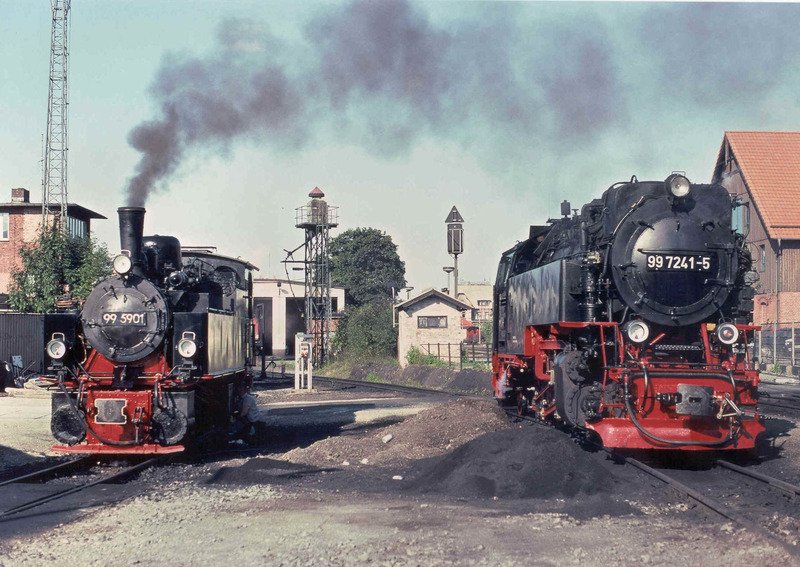 I got ready, and the two Reichsbahn Malletloks presented themselves at the north depot switch pulling a train of vintage green DR passenger cars, such as were used during the communist period. 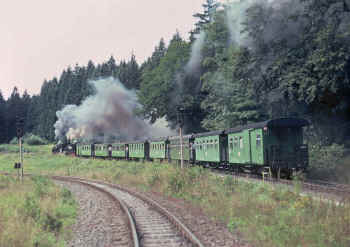 Two Malletloks storm up the Brocken Mountain, highest in Germany, with eight DR period color scheme cars full of lucky passengers. Most of the time HSB engines produce very little smoke, but firemen always pile on plenty of fresh coal when starting from this spot. While they took water I hiked down to the junction of the Brocken branch and got in line with some other folks who also wanted to get a picture of the double headed Malletloks. The composition was beautiful, and everyone at the crossing that day was overjoyed. I stayed a couple more hours, with just barely time to set up new camera angles between trains. 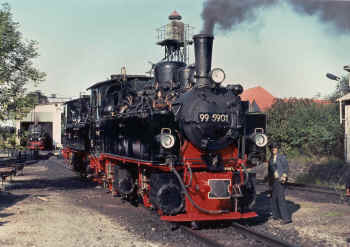 Twice there were three steam powered trains at once in the depot. Within ten minutes, they were all gone, and within a half hour or so there would be at least one to take their place..... When the light started to fade around noon, I decided that I had seen plenty of steam trains for one day already, and headed back to my hotel for a nap. I also had plenty of pictures. It would be a huge task to "completely cover" the HSB, and anyway, judging by the pictures in the books at the gift shop, it's already been done. The websites linked up from this article also have many fantastic pictures that put mine to shame!!! Following the two Malletlok sisters up Brocken Mountain is one of the 17 "Neaubauloks" or new manufacture steam engines, built by the Karl Marx Locomotive Works in 1956 and 57. None the less, it would not have done at all to miss the afternoon rush, so I jumped straight up out of bed when the first ray of sunlight skimmed one of my eyelids. Before long I was back at the roundhouse. Soon enough, I heard a whistle, and the inbounds began arriving. The engines are usually not turned, so they were running bunker first and coming at me straight out of the sun. However, after they cut off their trains, they were headed perfect for photography in the depot and back at the shop. This part of their service routine was devoted to cleaning ash pans, fires, and smoke boxes. Then a fresh fire was laid and banked, the boiler topped off, and the locomotive washed and put to bed until the next day. A couple of the monstrous looking Neubauloks went through this, then it was time for one of the Malletloks to make an appearance. Light is best in the afternoon, and the photographers mostly come in the morning. Her days labors on the mountain are over, and 7241 will soon be parked with a freshly laid fire and full boiler, until early tomorrow morning. No preserved steam engine ever had a better caretaker, friend, or daddy than Volker Baake, another steam experienced engineman who came to the HSB from the ultra professional East German State Railways. He is shown running the 5902 around her inbound train in the main passenger station before deadheading the equipment back over to the shops at Westerntor, two kilometers away. In the morning they had been double headed for a special run up the Brocken. I had known about this in advance and had timed my visit to coincide with this event, even though I hadn't been able to buy a ticket. 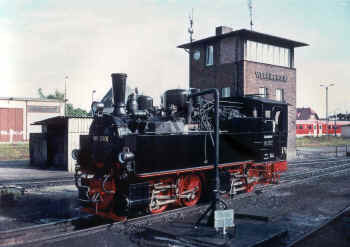 (Nowadays, you have an excellent HSB website and email, and you can get in touch with the railroad and translate using Google language tools.) For the return, the cars had been split into two sections, and each Malletlok returned with half of the train. 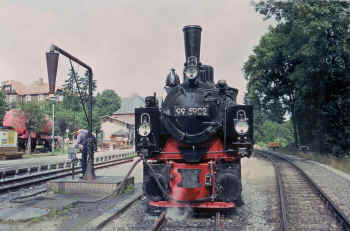 Six cars were left in the station, then the 5902 ran around her cut and took it back to the shops at Westerntor. The light was now perfect, and eventually the Malletloks were posed next to the bigger engines in various combinations and arrangements. I was in a kind of trance, and wobbled back to my bench by the turntable pit as the last locomotives shuffled into the roundhouse. It was boiling hot, and I had been standing within the shadows as I waited for sunlight on my various photo angles, only stepping into the light when necessary for an exposure. An old timer who had the fire cleaning/ash shoveling detail and I looked at each other as if we were both relieved that the day was over. 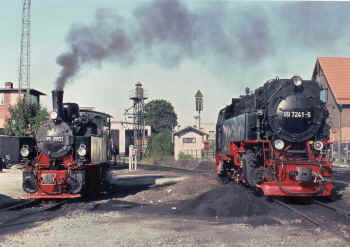 A sufficient number of identical, modern, well maintained, standard engines enables HSB to practice good fleet maintenance principles and apply the economies of scale to operation of steam locomotives in regular revenue service, as well as instituting standard training for a large pool of qualified, experienced enginemen. Most photographers take their pictures of the shop area from behind the fence which runs along the station platform, just visible in the right of this afternoon view. Of course those lucky enough to enter this restricted area are advised to stay out of sight of the photo line, not to climb on the equipment, or go in the buildings, or touch anything without asking. I was lucky they let me wash coal in this place. My new friend's name was Volker Baake, and our engineer was another fine fellow, Dirk-Uwe G�nther. Both of these guys were seasoned Reichsbahn steam crewmen, and had been with the HSB since the beginning. Even though 5902 was washed the evening before, and even though we were making a non-public equipment move only, she wasn't clean enough for this outfit. The first thing we did was wipe her down with waste soaked in kerosene. I mean we even shined the driving wheel centers! 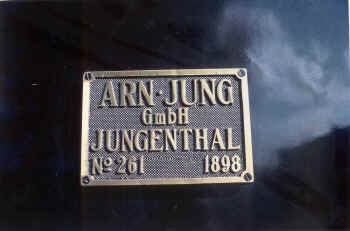 Then it was Brasso time on the whistle, brass numbers, and Jung builders plates. 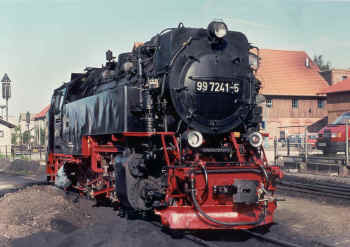 For all this spit and polish, German engines have clunky steel bells, painted black. I don't know why. The water glass cage, some steam fittings, reverse wheel, and throttle handle were all chrome plated. I expressed amazement at how pretty this centenarian was, and Volker looked at me puzzled like, asking, "your engines are not clean?" Fresh from a complete overhaul, 5902 is being conserved for special occasions, such as the double headed climb up Brocken Mountain earlier in the day. She wasn't clean enough for Volker and Dirk, who ran her into the shop and steamed her off after I took this picture. Now the 5902 is getting cleaned up inside the modern HSB running shop, which also handles standard gauge steam power once in awhile on the dual gauge tracks at left. The standard gauge DB station is in the background, complete with a working water crane next to the platform. I had to hurry to get this picture before Volker cleaned the water spots off 5902's plates with Brasso. 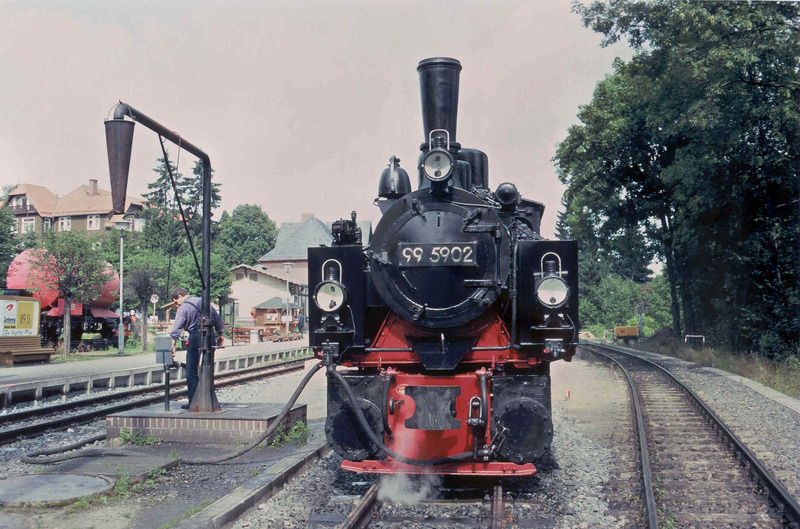 HSB is an ideal steam railroad to follow as a hobby --- it is as real as it gets, but is designed for enjoyment, having been built as a tourist railroad serving a national park region. An excellent selection of souvenirs, books, DVDs, etc. are available, and the line is quite popular with European HO and G scale narrow gauge modelers and manufacturers. It's hard to believe, but the construction date as shown here on the original plate of this original, historic rolling artwork, HSB 5902, is in error. It should read 1897. If you think this sheet metal is shiny, you should see the wheel centers, even on the outside frame rear engine section..... By the way, I also observed the crew of Malletlok 5901 shining her driving wheel centers. The lubrication ritual was different, too. 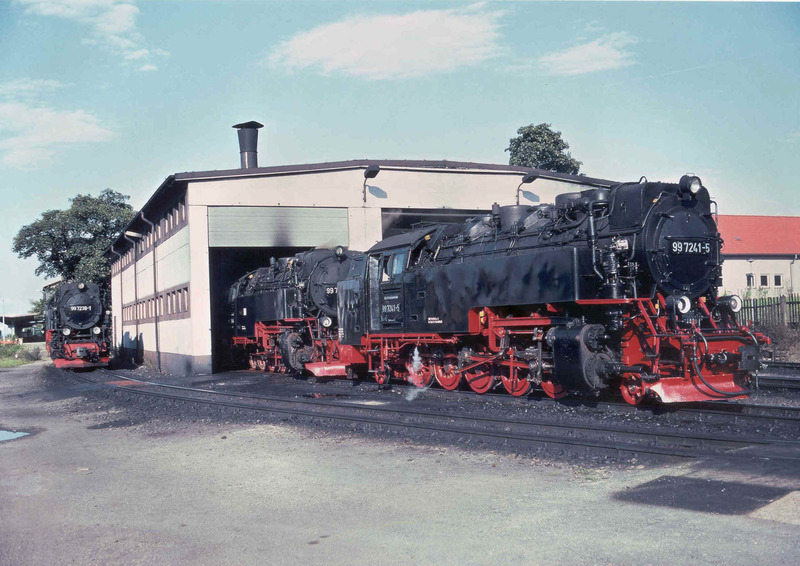 When I asked why they didn't lubricate the piston and valve rods before moving the engine for the first time in their shift, Volker pointed out the tail rods, and said that German locomotives didn't tear up their packing for this reason. Of course we communicated with gestures and phrases and fragments of our respective languages, but we caught each other's drift within seconds. Actually, everything was pretty much the same as it is in Baldwin country, but it all LOOKS different. For instance, the reverse has a screw adjustment with a big wheel and spinner, while we use a straight lever with ratchet quadrant. Our throttles are worked with long levers, again fitted with notches and latches, while the German design is a long lever having a horizontal pivot, swinging crosswise in the cab, without any notches. Then we loaded on all the coal she could hold, after first washing it to keep the dust down. It was piled in a box on the fireman's side tank, and there was a board set up blocking the engineer and me into the right side of the cab, while the fireman was knee to waist deep in coal. He only had to scrape it into the fire door for the first few kilometers. We casually chugged out of the shop area, stopping at Westerntor to pick up our coaches and do our brake test. Dirk tried his injectors, and the one on his side didn't catch. He shut off the valves and started taking the back of the injector apart. In the USA, this would definitely be hazardous, and I cringed and cowered in the back of the cab, unable to take cover. To my surprise, not a whisper of steam nor one single drop of scalding hot water came out when he removed the venturis. Score another one for German engineering. Then we walked inside the shop, and Volker cleaned up the packing seats with a pocket knife, wrapped them with twine, painted the seals with graphite, and had the guts ready to go back in within 10 minutes. Two minutes after that we were rolling south with two working injectors. In the states, we'd probably have had to get another engine, or make our trip another day. Since she was built, 5902 was first fitted with a dynamo and electric lights, then radio, and most recently with an automatic air brake system which is mostly concealed in the side tanks for cosmetic reasons. I couldn't understand much of what was being said, but it was obvious that both enginemen loved what they were doing, and joked and jived more or less non-stop with everyone they worked with. We hadn't made it out of the yards yet when the tower man dropped the signal in front of us. Before I had much of a chance to look around, I heard a whistle, and saw a passenger train pulled by one of the 2-10-2Ts scooting towards us, one track over. About the same time, another whistle announced another passenger train pulled by another Neubaulok coming from the other direction, two tracks over. They met right next to us, and both had cleared the interlocking limits inside a minute. The board popped up, and we followed the first guy's block up into the Harz Mountains. I had to admit that we were really railroading now. 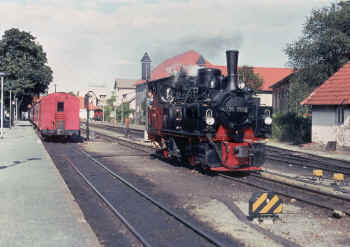 All day long, the Brocken engines run around their trains and take water at Drei Annen Hohne, while Northbound and Southbound trains pass through. Meets are frequent, even three way steam meets. And the Bratwurst and cold Hasser�der Beer are likewise available all day long on the platform. The busiest part of the system is between Wernigerode and the top of Brocken Mountain, and we and the train ahead of us were held for a few minutes at Drei Annen Hohne until another northbound crossed with us. Then we eased down to the water crane, and I dumped boiler chemicals in the side tanks while Volker filled them using the new waist level hose connection, and Dirk checked his orders with the operator. I'll never really know what it was like to be a DR steam crewman, but I sure enjoyed pretending for a few minutes while those other two trains passed us and we took water. It seems like we met another northbound at Eisfelder Talm�hle, a place in a sort of box canyon in the forest where time seems to move slowly. The four or five neglected looking yard tracks must have been necessary once upon a time, and a string of meter gauge roll wagons still held some ancient standard gauge cargo wagons last used a decade or so ago for a unit coal train. All are rusted to the rails, no doubt, and everything covered over with dust and cinders. This station is the junction of the line from Nordhausen to Wernigerode with the line from Gernrode, and as such is more important than it might at first appear. For the next portion of our trip, we would be headed north, so the engine was cut off for a runaround move within the interlocking limit. I saw my chance to take the throttle for a minute, and I must say that the German design engines sure feel different than a Baldwin. The operating rules were a little too different, and the language barrier made it awkward for all concerned, so that I gave her back to Dirk quickly before I broke too many rules. (The HSB offers by prior arrangement a very thorough and reasonably priced course of steam locomotive engineer's training, but it is for good reason available only to candidates fluent in both written and spoken German.) We tied onto the other end of our cars, made the air, took more water and chemicals, and made a very businesslike departure, now running bunker first. Day's end was approaching, and I had an excellent view of the fairytale landscape from the little Malletlok's rear portholes. The blend of fading sunlight and our gauge lights was magical inside 5902's cab, and I looked long and intently at her polished valve handles, regulator, gauges, and tubular water glass in it's fancy chrome cage. The crew thought I was worried about our water level, but I wasn't concerned one little bit. It was simply beautiful to look at. At Stiege we took the engine around a model railroad style reversing loop, then ran around the train so that we were still headed backwards, but were now back on the tail end of our cut. Dirk commented to me that it was like a big M�rklin set. That wasn't the only example of unusual track design I encountered, however. A little further on, near Strassberg, I observed several places where the track was laid on pressed steel ties arranged diagonally so that the ends alternately connect. Presumably the idea is to prevent the ties from creeping because of frost heaves in the wintertime, and I've also noticed some track laid this way on the Brocken Mountain branch. The resort town of Alexisbad was to be our last stop. We took siding, then water and chemical, then we headed inside and got comfortable. The lady train order operator seemed to be an old friend of the crew, and we shared a big pot of strong coffee with brown sugar. 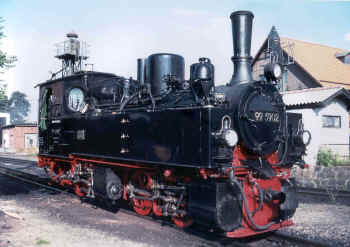 (Once just before WWII, Germany had traded 16 brand new narrow gauge Krupp 2-8-2 locomotives to Guatemala for several shiploads of coffee beans.) Paper, pencils, and German/English dictionaries were produced, and we had our first serious chance to talk trains all day. 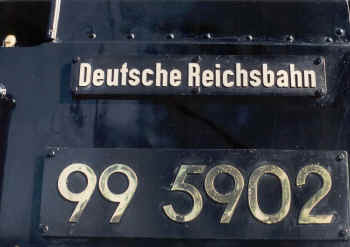 My plans had originally been to ride the Deutsche Bahn from Wernigerode to Dresden that night, and I had a train reservation and a room reservation. However, I figured that a Malletlok ride like this would be well worth missing my train or sleeping on the depot platform if necessary. I had taken my chances willingly. Since it looked like we had a bit of time to kill, I figured I'd ask my buddies which connection I needed to get to Dresden that night. They looked at my computer print out from the DB travel bureau. Then they started talking real fast in German, and Volker said, "Sammy drink your coffee". Those guys were already out the door, so I finished mine in one slug, ran outside, and jumped aboard the 5902. She was already moving. Dirk had her throttle open wide, and Volker was stoking the fire to beat Hell. Her shiny little drivers were cutting the cabbage and sparks rained from her stack. I correctly guessed that our meeting point had been changed as a courtesy to me, and that we were running for it. Yes we were. Two sidings further north, we headed in at M�gdesprung, then we heard the southbound whistle for the crossing. It was a three car local pulled by the 6001, a one of a kind on the HSB. 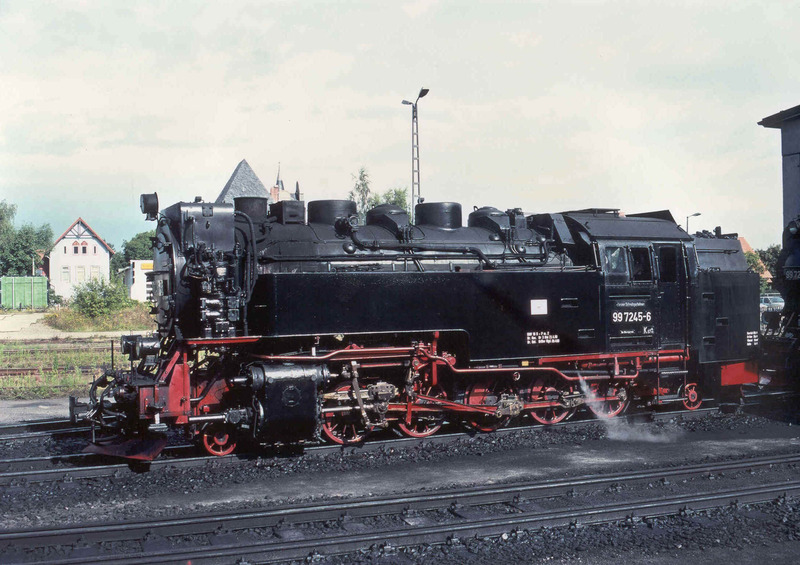 This was an earlier version of the Neubaulok having three driving axles instead of five. Too bad I couldn't have taken a picture of the meet, but at least I've lived it. The lights of the local whizzed by us, the switch popped over and we knocked down the board within 30 seconds. Again Dirk had her wide open, and Volker had that fire roaring, and 5902 was moving before I caught her ladder. She was picking up speed, too!! Besides the management and employees of the HSB, and most especially the crew of Malletlok 5902, I want to thank the webmaster of www.malletlok.de , Olaf Haensch, for making this article possible. Please visit this site for the best information and pictures of our beloved HSB Malletloks.